The number of college students fell for the first time in six years, according to new Census figures released this week. The half-a-million-student drop is "a huge decline," Census Bureau statistician Julie Siebens told me. This sounds like bad news. And while you won't find a bigger proponent of higher education than the Atlantic Business channel, I'd argue it's actually a sign of good news. It means the labor market is -- slowly, but surely -- getting better. The Census doesn't ask people why they are or aren't enrolling in college. So rather than a survey, we have to rely on a bit of intuition. But here's what we know. College is cheaper, in a way, during recessions, because the opportunity cost of leaving the work force to go to school is lower when there aren't any jobs out there, anyway. As a result, college enrollment typically accelerates during bad economic times. 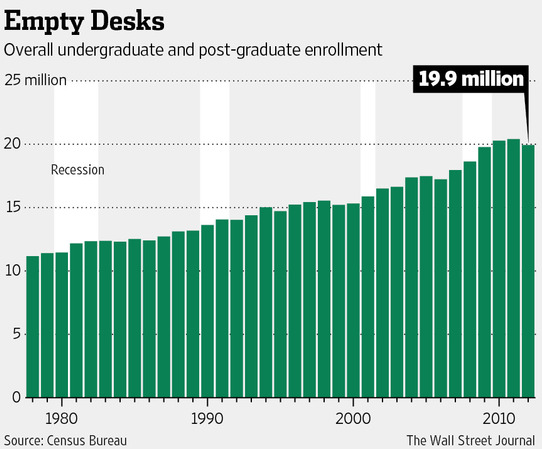 Since the peak of the housing bubble in 2006 (incidentally, the last year enrollment fell), college attendance has grown by 3.2 million students -- or 18 percent. Now we're seeing the reverse take place. The economy has improved steadily. Youth unemployment has fallen. And twentysomethings are going back to work. Ninety percent of the overall decline in enrollment was from students over 25. That is, students in their prime-working years. Steadily falling college enrollment would be bad news indeed. But a one-year correction suggests that students on the job-or-school bubble could be plowing their productivity into salaried jobs, Siebens said. The rest of the report is a mixed bag. On the one hand, college is getting significantly more diverse. As the Wall Street Journal reported, the share of non-Hispanic white students declined to 58% from 67% in the last six years. But rising college costs and fears of student loan burdens are likely depressing college attendance, too. In the long run, that's not a good story because, as we've written a million times, learning is earning power in the modern economy.